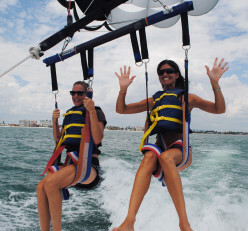 Parasailing on Ft. Myers Beach is an exhilarating experience with amazing views of our 7 mile long island. Remember, the scariest part of parasailing is waiting your turn. Then once you are up in the parachute, you’ll feel like you are literally “floating on air.” Customers tell us they had absolutely no idea how tranquil it would be when they were in the chute! For the safest, longest and highest flights- sail with us! Your entire family can enjoy these super-high flights. Landing on our six passenger, specially equipped parasail boat is a breeze. 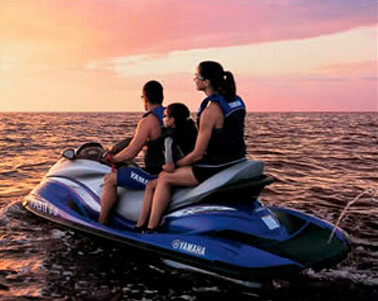 It is completely controlled by the parasail Captain, crew and the state of the art winch system. The crew fits you with a parasail harness and then you are seated next to your partner on the deck where you are gently launched and retrieved with a hydraulic winch system. Panoramic views and the experience of a lifetime awaits you. Go home with proof! Ask a team member about the photo package we offer. Crew members will take 20 or so high-quality digital photos during the excursion and film a short video during the DIP on an SD card. Then you may take the card home and digitally share them with as many people as you would like. All Parasailing is done for Mid Island Water Sports by an independent contractor. Estero Island Parasail’s chutes are flown by United States Coast Guard-licensed captains. The company takes pride in following closely with the top leaders and educators in the industry, including the FWC, USCG, WSIA, and following the industry standards of the ASTM. Group Discounts are available for 6 or more flyers – $5 off per person! Be sure to mention this offer to get your discount. Remember, no experience is necessary to fly single, double or triple. Best of all, any age can fly from 5 to 95!